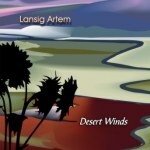 "Desert Winds is an interesting and engaging record of Flamenco and jazz inspired tunes. Full of creativity and energetic performances, the album is a strong artistic statement from the Montreal guitarist, one that is sure to expand his audience and bring his music to the wider, global community." In "Desert Winds", the color tends to be more exotic and more jazzy. Created from latin but also Gypsy rythms and harmony, Desert Winds conveys us to a vibrant voyage and make us dream. "I wanted more interaction with capable musicians that get their own sound. They really bring a personal touch to the end product. "